Remote controlled planes can give the user many many hours of fun. You can start off flying solo and even fly formations with your friends after you gain competence. There’s also a wide range of planes to choose from with plenty at reasonable prices – perfect for beginners. We’ve even seen devices designed to be flown indoors! 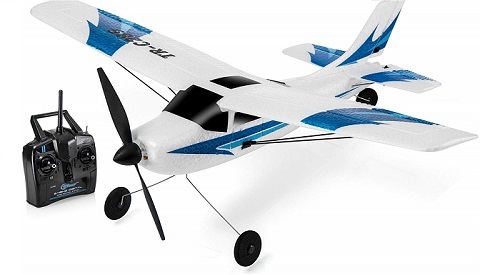 All of the best remote control planes listed on this page have been handpicked and independently chosen by the folks at Gifted Geek. Look out for this icon which tells you how long you can fly the plane for before the battery needs to be recharged. The longer the better obviously! Some batteries take only 30 minutes to reach a full charge, others take many hours. Check out this icon next to each remote control plane to see how long it takes to charge the batteries. The range of the device is important, the higher and further you can fly your plane, the more fun you can have. More range usually means more weight though. This is the total weight of the plane and includes the battery. More expensive lightweight planes can often stay aloft longer but aren’t as robust as some heavier variants. If you lose control of the plane mid-air, this button will level the wings for you. This is a great safety feature for those just starting out with remote control planes. Here are our top two favourite remote control planes. These are priced favourably and are perfect for those just starting out. The Top Race Trainer TR-C285 is a three channel (Elevator, Rudder and Throttle) aircraft, designed for beginners in the sport. Its 6-axis gyro can be set to one of three modes: Beginner, Intermediate and Expert. In beginner mode, the aircraft can remain stable, even in windy conditions. The TR-C285 is ready to fly, out of the box and utilises 2.4 GHz control technology that offers a flight range of around 320 feet and allows up to 20 aircraft to be flown in the same locality. Power is provided by a 3.7 volt 180 mAH Li po Battery. Its improved design allows up to 15 minutes flight time from a 90 minute charge. The aircraft is constructed of lightweight EPP making it durable and shock resistant, ideal for the novice flyer. Its small, lightweight design allows for easy transportation to wherever it is to be flown. The transmitter requires 4 AA batteries (not included). 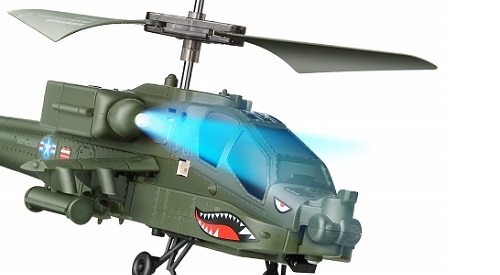 The Syma S107 offers an excellent introduction to basic helicopter flying and comes ready to use, straight from the box. Its twin rotor design means that the S107 is very stable and therefore ideal for the beginner or young user (Adult supervision required). The 107 has a strong, aluminium frame making it lightweight and resistant to crashes. The remote control features three channels and is infra red, making it ideal for indoor flight. The onboard Li Po battery takes around 30 minutes to charge and will give approximately 8 minutes flight time. Charging is via USB to a PC or the hand controller, which requires 8 AA Batteries (Not Included). 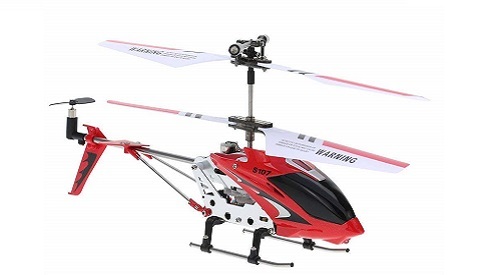 The diminutive size and weight of the S107 make it an ideal platform to learn and enjoy the pleasures of RC helicopter flight. The Parrot brings a new dimension to drone flying, with its fixed wing configuration and cockpit glasses technology allows the user to see the flight from a new perspective (requires smartphone and the freeflight pro app). 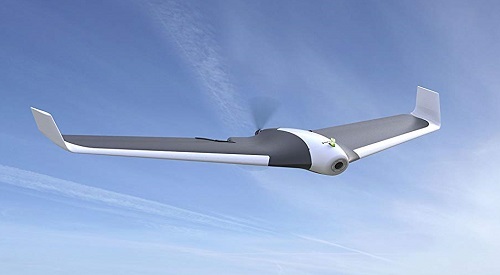 The Disco is the first fixed wing drone that is capable of sustaining 50 mph and extended battery life allows up to 45 minutes flying time, with a range of approximately 1.2 miles. The drone has a number of flight modes that cater from the novice, right up to the professional flyer allowing safe and enjoyable flight for all levels of piloting. Take off and land can be carried out safely, with the touch of a button. The 1080p camera produces crisp video footage and has recording capabilities to capture the long flights. The Sky King is an excellent aircraft for both the beginner and the more experienced pilot, and comes with all the features expected of more expensive machines. Its impact resistant EPO construction can soak up minor bumps and its predictable flight characteristics make it easy to fly and land. 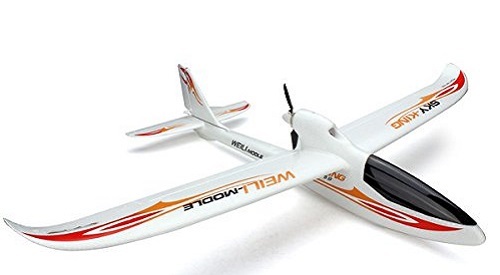 The aircraft uses 2.4 Ghz technology and has beginner and experienced mode, its 7.4 volt coreless motor produces a smooth powerband, enhancing its flight envelope. The controller features trim switches to ensure perfectly level flight and a battery warning system is incorporated. Flight time in normal usage is approximately 10 minutes, with a charging time of 90 minutes. Two batteries are provided to offset the charging cycle. A great all rounder regardless of the pilot’s skill level and is ready to fly, out of the box. The S109 is an ideal starter helicopter, with its 3 axis gyro and contra-rotating blades making straight and level flight easily attainable by the most inexperienced pilot. The infrared remote control gives the S109G a range of approximately 10 metres making it ideal for both indoor and outdoor flight, with its LED’s making it particularly impressive during the evening. the Li Po battery gives a flight time of around 6-8 minutes and takes approximately 55 minutes to recharge via the included USB, connected to a PC. It’s compact and robust design make it an ideal starting point for helicopter flying as well as allowing it to soak up the minor knocks and scrapes that are inevitable with an inexperienced pilot. These tips will help you get the most from your new RC plane. Have fun and keep safe. If you really enjoy flying a budget range RC plane, you’ll soon want to upgrade to something that charges quicker, lasts longer in the sky and is more maneuverable. 2) Try launching by hand, this will save the battery power and your device can stay in the air for longer. 3) Check the wind speed and direction prior to launch. 4) Always try to land into the wind, you’ll have more control and be less likely to overshoot. 5) Buy spare batteries so you can continue the fun without having to go home and wait for them to recharge. 6) Start off by flying your craft in a wide open space where there’s plenty of space to land and few obstacles. 7) Check local laws, especially if you intend to fly your device in a built-up area, near an airport or a military establishment. 8) Consider choosing a drone instead, they are self-stabilizing and the market is competitive with plenty of products to choose from.